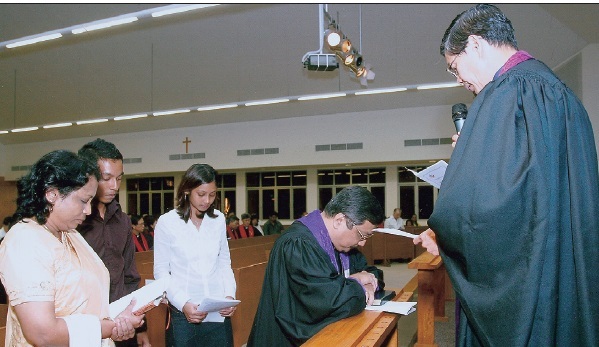 THE 30th Session of Trinity Annual Conference, which was held from Nov 21 to 24, 2005 at the newly renovated Trinity Methodist Church, marks several milestones. Firstly it marks 30 years as an Annual Conference. As the conference commenced, Bishop Dr Robert Solomon reminded the delegates of John Wesley’s first conference – that it was a time for revival, fellowship and getting together in united mission. The Bishop shared that 30 years is a significant number in the Bible. At the age of 30, many biblical figures were placed in strategic situations and commenced their ministry. They included Joseph, King David and our Lord Jesus. 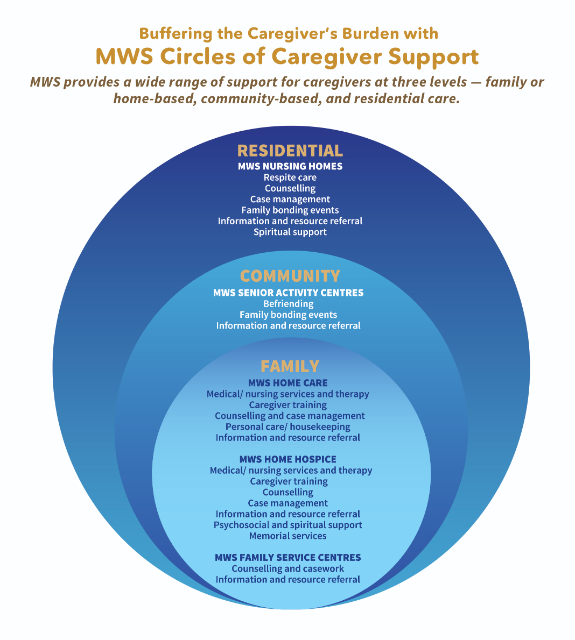 Thirty years is a significant age for TRAC, a strategic moment in time. As a people called Methodists we need to know our identity. We will face many temptations and so it is important to know our identity. As a people of God, we need to seek God’s wisdom and discernment so as to face up to temptation so that through our ministry our Father’s will may be accomplished. Secondly, the session welcomed the 19th and youngest Local Conference – Christalite Methodist Chapel – which was constituted after the Special Session last July. Thirdly, and looking forward, the conference heard the announcement that the 20th Local Conference of TRAC would be constituted on Dec 4, 2005. 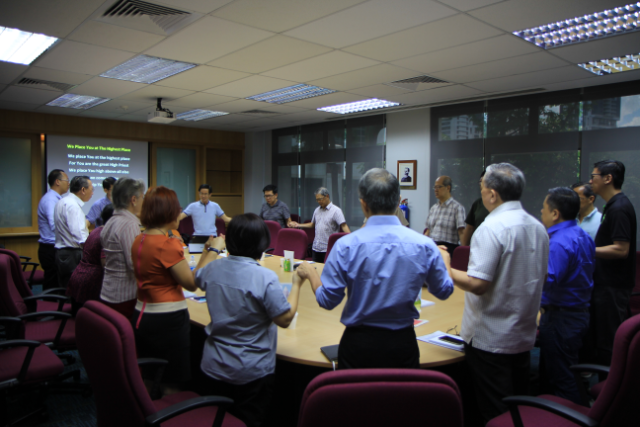 The Rev Chiu Ming Li presented the story of the birth and growth of Faith Methodist Church’s Jurong Preaching Point. It was constituted as Agape Methodist Church. Fourthly, the conference witnessed the retirement of the Rev Dr Clarence Lim, who would also step down as Director of the Methodist Missions Society (MMS). The conference accorded him a standing ovation for his many years of dedicated and selfless ministry to the Lord. A Thanksgiving Service and Fellowship Dinner to mark his retirement was held on the evening of Nov 23 after the day’s conference session. Conference delegates were welcomed warmly to the host church by its Pastor-in-Charge, the Rev Philip Lim, and its Local Church Executive Committee Chairman, Dr Hum Sin Hoon, who noted that this was the first time the Trinity Annual Conference was being held at Trinity Methodist Church. At the Opening Holy Communion Service, Bishop Dr Solomon celebrated Holy Communion and TRAC President, the Rev Wee Boon Hup, preached a sermon entitled “There’s A Fresh Wind Blowing” based on Acts 2:1-21. He recounted the experience of the early church as recorded in Acts 2, and compared that with the experience of John Wesley and Bishop Oldham. The Rev Wee noted that in our Methodist tradition, we find a consistent passion for revival and holiness, and the desire to experience the power of God in mighty ways. As the church in Acts waited for power from God, and just as the great men of our tradition had also sought new spiritual revival and empowerment in fervent prayer, so we should also seek the “fresh wind” of the Holy Spirit today, to move in the direction God is leading, and in step with His Spirit. 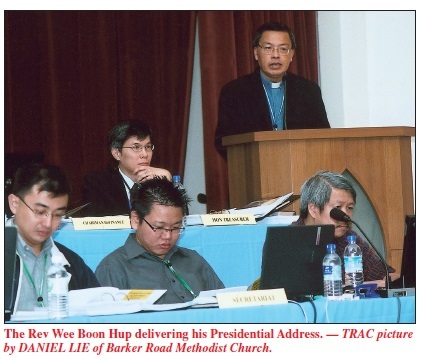 In his Presidential Address, the Rev Wee noted that there were good signs for the conference with increases in membership, baptisms, worship attendance and small group participation. His visits to TRAC churches showed that in general, there is vibrancy in their worship services, systematic and consistent effort to reach out to surrounding communities adjacent to the churches, energy in the youth ministries, a growing number of Sunday Schools transforming into Children’s Ministries, the presence of able-bodied seniors and retirees in the congregations and mission efforts outside Singapore. He outlined the key themes of concerns for the conference as “TRAC” – Transforming, Redeeming, Anointed Congregations. 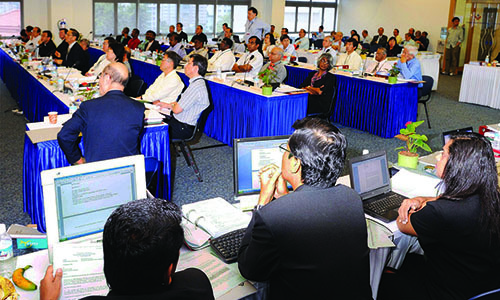 He shared that the way forward for TRAC is to maximise its potential and depend on the Holy Spirit to empower and lead the conference; to build up its resources, especially in equipping the leaders, both lay and clergy, to meet new challenges; and to focus on its mission as a church as given in the Great Commission. Besides the usual presentation of reports, the conference also discussed concerns such as the recruitment of new and younger pastors, in view of the number of pastors due to retire in the future, as well as to meet the projected growth of the conference as a whole. Leadership training and development of lay leaders of the local churches were also discussed at some length. At the Closing Ordination Service, the Rev Wee preached on “The Future of Our Ministry” based on 1 Corinthians 14. The service was specially blessed by the presence and voice of a Combined Choir comprising choir members from many TRAC churches, led by Mr Yusuf Kam, who rendered an uplifting anthem “Proclaim the Glory of the Lord”. 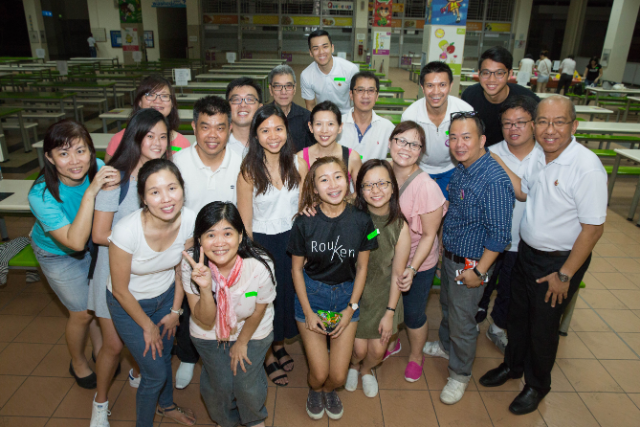 The Lay Leader, Mr Kim Seah, presented six new local preachers: Ms Anna Loo, Mrs Aggie Gui, Mr David Gwee, Ms Stella Wan, Ms Patricia Wong and Ms Lee Shuit Kuin. Bishop Dr Solomon presided over the ordination of Deacons and Elders. The five new Deacons ordained were the Rev Lai Kai Ming, the Rev Raymond Sim, the Rev Daniel Cornilius Tan, the Rev Tay Kay Leong and the Rev Joel Yong. The two new Elders ordained were the Rev Dianna Khoo and the Rev See Swee Fang. Bernard Chao is the Assistant Pastor at Aldersgate Methodist Church.